You may hear people talk about low-frequency bass sounds being nondirectional, which means that you can’t really locate where they are coming from by ear. Proponents of this concept will tell you that your subwoofer can be hidden well out of the way. Subwoofers are nondirectional, to a degree, but putting your subwoofer too far away from the rest of your speakers (and from your listening position) can lead to situations in which you do hear where the bass is coming from. If you move your subwoofer too far to the left or right, the bass isn’t well integrated with the sound coming from the other speakers. In most cases, it’s actually better to not hide the subwoofer. Many vendors recommend that you place your subwoofer in a corner. This placement reinforces the bass significantly. However, in some rooms, you can get too much reinforcement of your bass in the corner, and you end up with boomy bass. This means that the bass notes become indistinct; you just hear a low-frequency sound and can’t distinguish between the different frequencies. So if you’re listening to a recording of someone playing a Bach fugue on a pipe organ, you don’t hear the distinct notes in the lower register. If this happens to you, try moving the subwoofer out from the corner a bit. One good way of finding a place for your subwoofer is to swap places with it. Put the subwoofer right up where you sit and turn on some bass-heavy music (or a bass-heavy movie soundtrack). Walk around the room until you find the place where the bass sounds best. Now, swap back by putting the subwoofer in the spot where the bass sounded best. 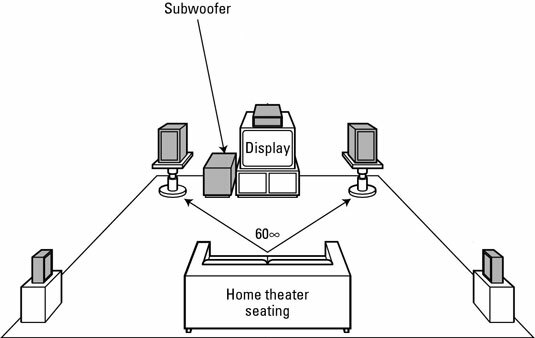 The diagram shows a typical 5.1-channel, surround-sound speaker configuration, with the subwoofer placed along the front wall. In a typical 7.1-channel configuration, the center, front, and surround speakers are in the same location as they are in a 5.1 layout, but you’ve added two additional rear surrounds located farther behind the main listening position. The subwoofer is typically placed at the front of a home theater.